It’s time for all law enforcement to STOP standing down & teach the spoiled brats a lesson tgeybwontbsoon forget. It’s unfair to our heroic law enforcers to stand by, receive possible injuries by this pathetic group ANTIFA. Their babe itself makes no semse/ ANTI FASCISTS. The fact theyre instructimg members how to inflict injuries on our bravest protectors is an oxy moron. Anti fascists are just that, anti (non) fascists. Not exactly what theirvsilly name suggests. I wish Our Commander in chief iverrides local law enforcement leAders and instructs all police officers to STOP the ridiculous stand down orders. I suspect it would take 10 mins or less before these cowards disperse into the nearest basement of grandmas house. Cowards wear masks, cowards use weapons of destruction & cowards destroy property belonging to others. They should change their name to BIG UGLY COWARDS! Time to install “Martial Law”!! It might relieve the violence in demonstrations if the authorities, approving permits for them, would require all demonstrators to be clear faced or without masks, or face arrest. Then all these paid demonstrators would disappear. These cowards would be afraid to show themselves. Nice idea, Bob, but it would have to be enforced without exception even if the use of deadly force is necessary. It’s also time for citizens to arm themselves to protect themselves and their property against this scum and for juries to nullify any charges brought against citizens defending themselves, their property or their communities since their local cnstabulary, in many cases, will not. I find it interesting that the “Antifa” group are some of the biggest fascists in the country in spite of their name. Might be that law enforcement has infiltrated the entire movement and is just awaiting the right time to round them up in one swoop. They are awaiting the escalation of their criminality to gather public support so that there is no doubt as to their guilt. 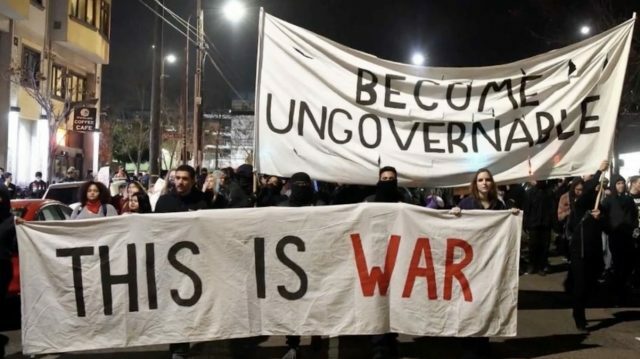 Like the weather Underground they will be broken up and destroyed as an organization since many of them are college professors and others with jobs and a stake in society they are identifiable and easy to track down. They will be an easy target since they will be deprived of resources and their identities will be widely known. Jail has a way of quelling revolutionary zeal within the white middle class of radical chic cowards. Those good old jailhouse has gangs that are not little white boy revolutionaries playing games. This is a criminal organization supported by the democrats. Where is the FBI?